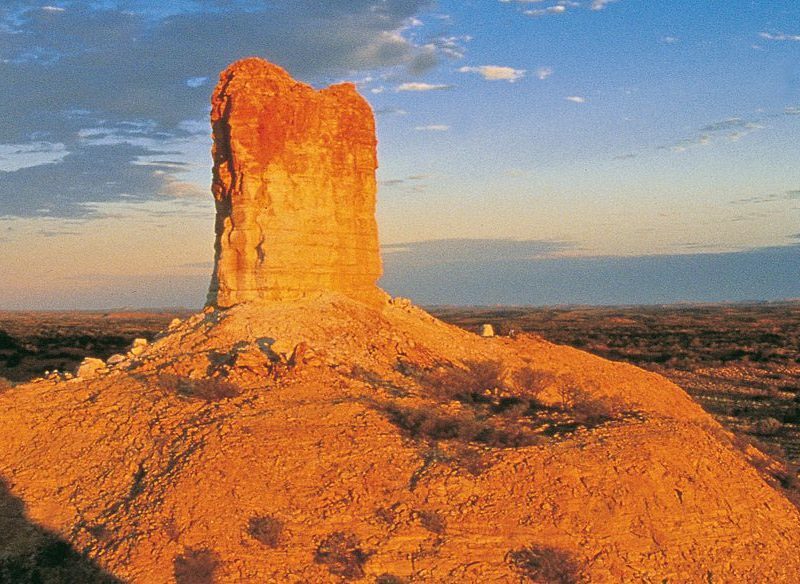 History, Aboriginal belief, a natural phenomenon and adventure are all combined in this one-of-a-kind landmark: Chambers Pillar in the Northern Territory. The sandstone column 160km south of Alice Springs stands 50m above the plain, making it easy for desert travellers to navigate by. 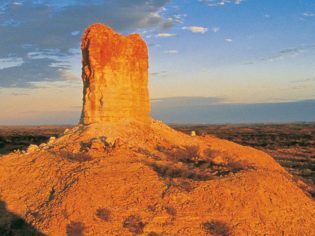 Similar to Uluru, you can gaze at Chambers Pillar as it changes colours dramatically through sunrise and set, intensifying to a reddish-gold glow like a huge gleaming beacon. The history of the site starts 350 million years ago, when sandstone deposits were laid down in the area. Wind and rain have eroded away the softer material, leaving Chambers Pillar as a solitary column. It was named by John MacDouall Stuart in 1860, on his earliest attempt to cross Australia (James Chambers was one of his sponsors). Besides being a witness to early European exploration, the pillar is of great Aboriginal importance; it’s believed to be an ancient ancestor, who became the pillar after being banished by relatives. The pillar itself also bears the marks of several early explorers, including Alfred Giles and John Ross, leaders of the second cross-continental expedition in 1870. Their initials are visible as J Ross and AC 1870. 160km south of Alice Springs along the Old South Road. The road is unsealed, may be closed after rains, and 4WD is required. Recent visitors have added their own graffiti to the pillar just as early explorers did. This is illegal and unfortunate, but also poses the question: At what point in time does graffiti stop being historic and just become annoying? Is this Australia’s most beautiful festival?